This photo from Uber shows someone using the app's new chat feature. One slightly annoying thing about Uber is that your driver sometimes has to call or text you to let you know they're arriving, held up in traffic or give you some other update about your ride. 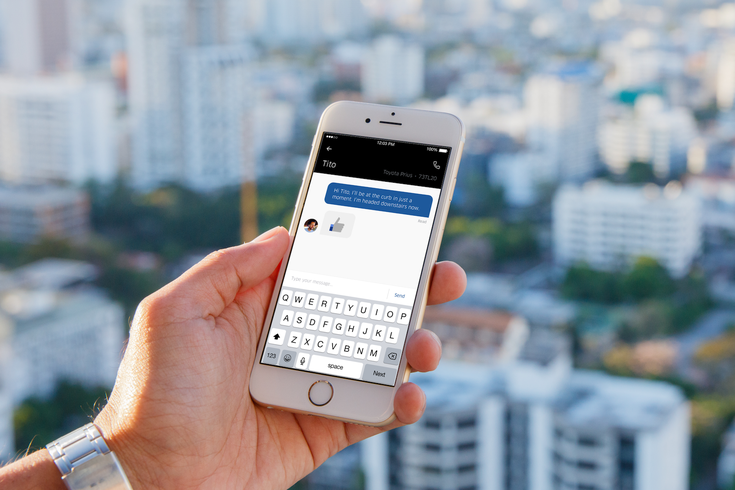 Today Uber is announcing a new in-app chat feature, which allows riders and drivers to chat with one another right in the app. It’s a faster and cheaper experience with no toggling between Uber and other messaging/calls and no voice call or SMS costs. Riders and drivers will be able to see when the other person is typing and whether the chat has been delivered and read. For drivers, chats are read aloud, and one tap to the app will send a “thumbs up” confirmation to their ride so they can stay focused on the road. When connected to a driver, a rider should go to the Uber feed and tap “contact” and then “chat.” The rider can easily chat with their driver in real time. Again, it's a nice upgrade, but it wasn't the most burdensome problem with the app in the first place, considering in many instances you can just walk out when you see your driver on the app without needing to call or text at all. Our in-app chat feature also means that regardless of where they are located – whether it be Cleveland, Chennai or Cartagena – riders and drivers won’t need to share their phone number with one another when they need to get in touch. In other words: You don't have to worry about your potentially creepy driver trying to hit you up after you've been dropped off. The chat feature will be rolled out over the next few weeks for all drivers and riders using iOS and Android. You can find out more about it here.